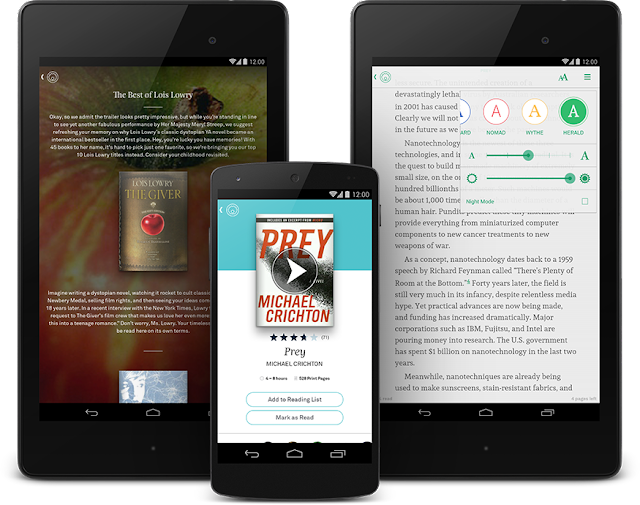 Google Play reaches over 1 billion monthly active users giving developers the world’s largest app distribution platform. Last year, Play users installed apps 65 billion times. To keep that great momentum going, we’re continuing to listen to your feedback and invest in more ways to help you grow your app or game business. Today, we’re sharing new features that benefit developers of all sizes. 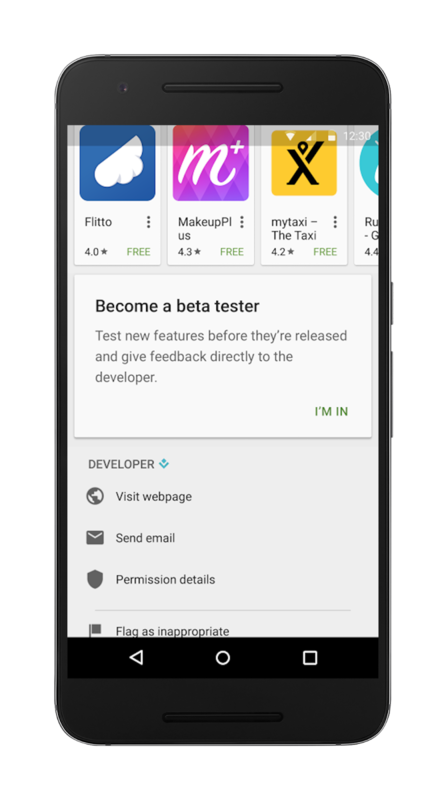 Beta testing is a crucial tool that many developers use in the Google Play Developer Console to test their apps with real users, gather feedback, and make improvements before launching widely. Open beta tests are helpful to get feedback from a large group of users and allow any user to join a beta test. We're making open beta tests easier to find and participate in: apps that are available only as open betas and aren’t in production yet will soon appear in Play search results, users will be able to opt-in from Play store listings directly, and users will be able to send you private feedback through your Play store listing too. 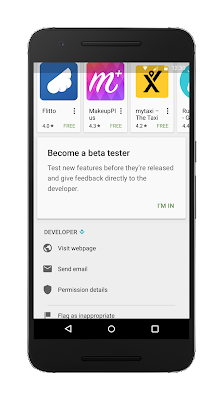 We'll also be adding a new featured section to the store, called Google Play Early Access, showcasing a hand-picked group of promising open betas that haven’t gone to production yet. There are more than a million apps available on Google Play and we continue to work on making it easy for people to discover the apps they’ll love. 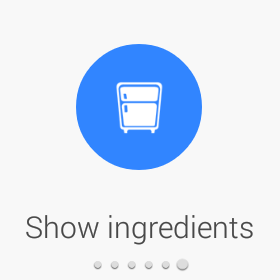 To that end, you’ll start seeing new collections on the store for tasks that might require a combination of apps. 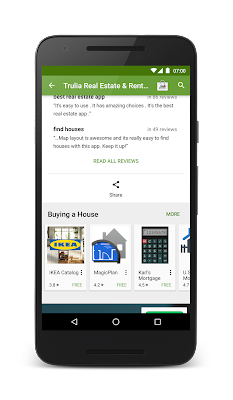 For example, when you're buying a house, you’ll see the best apps for finding real estate, keeping notes, getting a mortgage, and travelling in the area in one handy collection. Developers don’t need to take any action to take advantage of this benefit, apps will automatically be chosen. 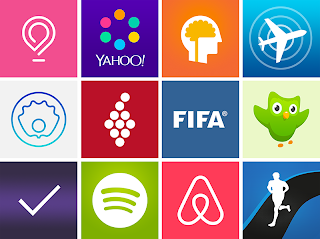 These contextual collections make it easier for users to discover complimentary apps as well as new types of apps. Your app business relies on having high quality apps. To achieve quality, your apps need to be tested on a range of real devices before you ship them to your users. 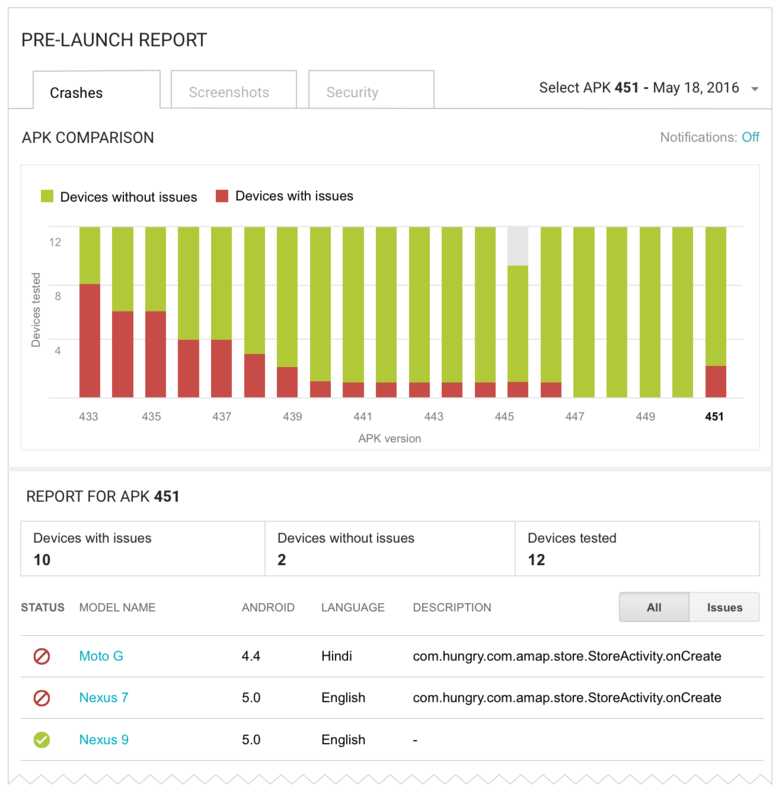 Play’s new pre-launch report summarizes issues found when testing your app on Firebase Test Lab for Android on a wide range of devices. Along with diagnostics to help you fix any crashes we detected in your app, your reports will also include screenshots from devices that use different Android versions, languages, and screen resolutions. These can help you find layout issues. We’ve also included early warnings of known security vulnerabilities that may have sneaked into your app -- even via third party libraries you rely on. You can enable the pre-launch report in the Developer Console. Your app reviews offer a wealth of information on what your users like and dislike about your app. We’re expanding on the improvements we made to ratings and reviews earlier this year, to offer you more ways to take advantage of reviews and better engage your audience. 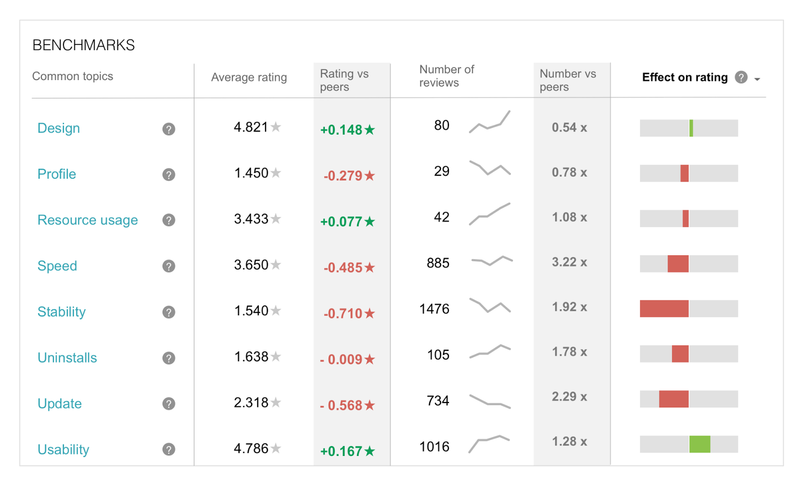 Review benchmarks let you see your app’s rating distribution compared to similar apps in your category for a list of common topics which are relevant for all apps – like design, stability, and speed. 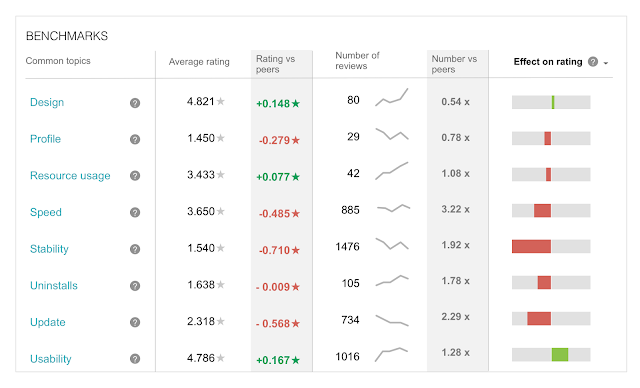 You are also able to see how each area impacts your app’s rating. 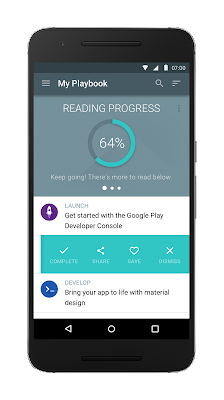 Review topics will let you see your app’s rating distribution for a list of topics which are specific to your app. With this analysis functionality, you can more easily identify what users think of your app and where to focus your improvement efforts. Developers frequently tell us they find replying to reviews valuable as a channel to directly engage their audience and gather feedback. In fact, we have found that users who update their star rating after a developer has responded to their review increase it by an average of 0.7 stars. For developers who have their own customer support solutions, we’re making replying easier with a new Reply to Reviews API. In the last few months, we’ve tested the API with Zendesk and Conversocial, so you can now start replying to reviews directly from those popular platforms or build your own custom integration. The User Acquisition performance report in the Developer Console gives you a snapshot of how many users visit your store listing, how many install your app, and how many go on to make purchases. 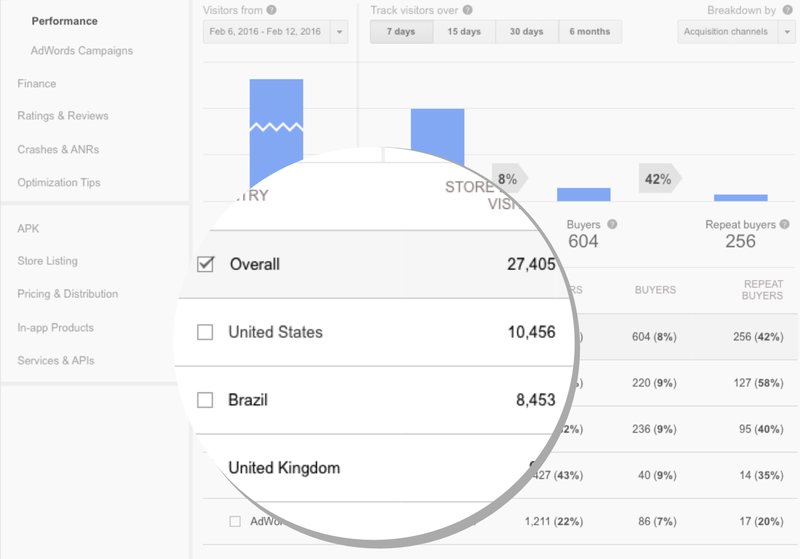 We’ve now added the ability to see user acquisition data by country and you’ll soon be able to see user acquisition benchmarks and compare your app’s conversion rates to similar apps on the Play store. With this data, you can find opportunities to focus your marketing efforts and increase your installs with tools like Store Listing Experiments. Hundreds of millions of users, many of them in emerging markets, are coming online and, for many of them, their first experience is on an Android device. To help you get your app ready for this opportunity, we’ve created Building for Billions guidelines with a development checklist to help you optimize your app. You can also get more in-depth tips and best practices for expanding to new markets in the accompanying Building for Billions Playbook. To help you meet local expectations when you set your prices and make purchases more attractive to your users, the Developer Console will now automatically round prices to local conventions in each market. For example, for a US app priced at $1.99, a user in Japan would see ￥200 rather than a non-rounded price from a straight FX conversion. You can also set up pricing templates to change pricing for products in bulk. You can make this change in the Developer Console. 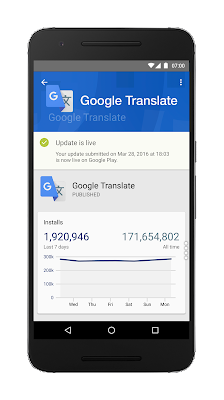 While you're working on getting your app ready for billions of users, we've been enhancing the Google Play experience for them too. With improved compression, we've made app updates more data efficient, and we're focusing on making the Play Store itself faster than ever on all connection types. We’ve also revamped how we select visible apps in key markets like India and Brazil to better showcase apps that are more relevant locally and apps made by local developers. And we continue to add more payment methods in new countries, including carrier billing and gift cards in India and Indonesia. To give you access to your data when you need it, and to keep you informed of crucial business updates with notifications, we’re launching the Play Console app. 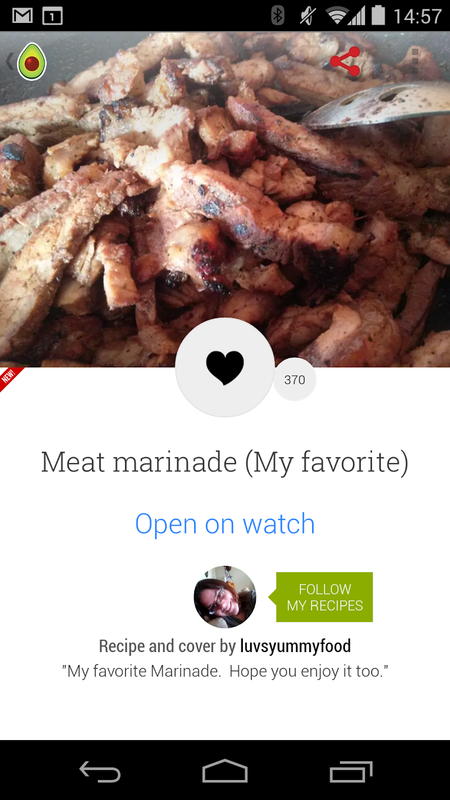 You can access your app’s data including installs, uninstalls, crashes, ratings, and reviews. You can also receive push notifications for important news like when your app update is live on Google Play. And you can even reply to reviews directly in the app, making it easier and quicker to engage your audience when you want to. Get the Play Console app on Google Play today. Staying on top of all the features and best practices and strategies you should consider when growing your business can be a challenge. 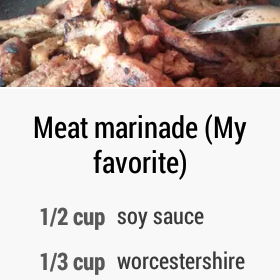 We’ve built another app, the Playbook by Google Play. The Playbook is a tailored list, based on your objectives, of the latest articles and videos from Google experts and across the web to help you grow a successful business on Google Play. Join the Playbook beta today and let us know your feedback. Finally, we will be soon making some updates to the Developer Distribution Agreement (DDA), which includes the ability for family members to share purchased apps on Google Play. Here you can see the updated DDA. To learn more about all of these features, tune-in live to ‘What’s new in Google Play for developers’ at 11am PDT / 2pm EDT / 7:00pm GMT+1 on May 19 on the Google Developers YouTube channel. If you’re attending I/O, come and visit the Google Play sandbox to get your app reviewed by experts. Whether you’re attending I/O in person, at one of the many I/O Extended events around the world, or just watching from home, you can find more Google Play sessions in the I/O 2016 schedule. Imagine a beautiful virtual forest with countless trees, plants and vegetation, or a stadium with countless people in the crowd cheering. If you are heroic you might like the idea of an epic battle between armies. Rendering a lot of meshes is desired to create a beautiful scene like a forest, a cheering crowd or an army, but doing so is quite costly and reduces the frame rate. Fortunately this is possible using a simple technique called Geometry Instancing. Geometry instancing can be used in 2D games for rendering a large number of sprites, or in 3D for things like particles, characters and environment. The NDK code sample More Teapots demoing the content of this article can be found with the ndk inside the samples folder and in the git repository. Geometry instancing is available from OpenGL ES 3.0 and to OpenGL 2.0 devices which support the GL_NV_draw_instanced or GL_EXT_draw_instanced extensions. More information on how to using the extensions is shown in the More Teapots demo. Submitting draw calls causes OpenGL to queue commands to be sent to the GPU, this has an expensive overhead which may affect performance. This overhead grows when changing states such as alpha blending function, active shader, textures and buffers. Geometry Instancing is a technique that combines multiple draws of the same mesh into a single draw call, resulting in reduced overhead and potentially increased performance. This works even when different transformations are required. To explain how Geometry Instancing works let’s quickly overview traditional drawing. 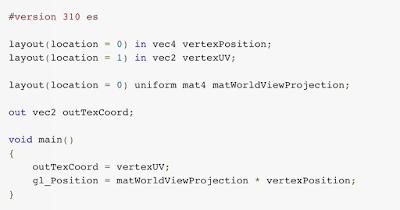 To a draw a mesh you’d usually prepare a vertex buffer and an index buffer, bind your shader and buffers, set your uniforms such as a World View Projection matrix and make a draw call. To draw multiple instances using the same mesh you set new uniform values for the transformations and other data and call draw again. This is repeated for every instance. Geometry Instancing reduces CPU overhead by reducing the sequence described above into a single buffer and draw call. It works by using an additional buffer which contains custom per-instance data needed by your shader, such as transformations, color, light data. The first change to your workflow is to create the additional buffer on initialization stage. Note that uniform blocks have limited sizes. You can find the maximum number of bytes you can use by querying for GL_MAX_UNIFORM_BLOCK_SIZE using glGetIntegerv. The next step is to update the instance data every frame to reflect changes to the visible objects you are going to draw. Once you have your new instance buffer you can draw everything with a single call to glDrawElementsInstanced. You update the instance buffer using glMapBufferRange. This function locks the buffer and retrieves a pointer to the byte data allowing you to copy your per-instance data. Unlock your buffer using glUnmapBuffer when you are done. You might have noticed the use gl_InstanceID. This is a predefined OpenGL vertex shader variable that tells your program which instance it is currently drawing. Using this variable your shader can properly iterate the instance data and match the correct transformation and color for every vertex. That’s it! You are now ready to use Geometry Instancing. If you are drawing the same mesh multiple times in a frame make sure to implement Geometry Instancing in your pipeline! This can greatly reduce overhead and improve performance. Uniforms variables in GLSL are crucial for passing data between the game code on the CPU and the shader program on the graphics card. Unfortunately, up until the availability of OpenGL ES 3.1, using uniforms required some preparation which made the workflow slightly more complicated and wasted time during loading. Note: You might be familiar with this shader from a previous Game Performance article on Layout Qualifiers. Find it here. The inefficiency appears when you want to assign the uniform value. You need to use glUniformMatrix4fv or glUniform4f to set the uniform’s value but you also need the handle for the uniform’s location in the program. To get the handle you must call glGetUniformLocation. That pattern leads to having to call glGetUniformLocation for each uniform in every shader and keeping the handles or worse, calling glGetUniformLocation every frame. Warning! Never call glGetUniformLocation every frame! Not only is it bad practice but it is slow and bad for your game’s performance. Always call it during initialization and save it somewhere in your code for use in the render loop. This process is inefficient, it requires you to do more work and costs precious time and performance. Also take into consideration that you might have multiple shaders with the same uniforms. It would be much better if your code was deterministic and the shader language allowed you to explicitly set the locations of your uniforms so you don’t need to query and manage access handles. This is now possible with Explicit Uniform Locations. This means you never need to use glGetUniformLocation again, resulting in simpler code, initialization process and saved CPU cycles. As Explicit Uniform Locations are only supported from OpenGL ES 3.1 we also changed the version declaration to 310. This change is extremely simple and the improvements can be substantial, producing cleaner code, asset pipeline and improved performance. Be sure to make these changes If you are targeting OpenGL ES 3.1 or creating multiple APKs to support a wide range of devices. To learn more about Explicit Uniform Locations check out the OpenGL wiki page for it which contains valuable information on different layouts and how arrays are represented. Let’s start with a simple vertex shader and change it as we go along. To draw a mesh on to the screen, you need to create a vertex buffer and fill it with vertex data, including positions and texture coordinates for this example. To associate the vertex data with the shader attributes, a call to glGetAttribLocation will get the handle of the named attribute. The attribute format is then detailed with a call to glVertexAttribPointer. But you may have multiple shaders with the vertexPosition attribute and calling glGetAttribLocation for every shader is a waste of performance which increases the loading time of your game. Note that we also changed outTexCoord from varying to out. The varying keyword is deprecated from version 300 es and requires changing for the shader to work. Note that Vertex Attribute qualifiers and #version 300 es are supported from OpenGL ES 3.0. The desktop equivalent is supported on OpenGL 3.3 and using #version 330. This simple change leads to a cleaner pipeline, simpler code and saved performance during loading time. To learn more about performance on Android, check out the Android Performance Patterns series. Today, we want to share some best practices on using the OpenGL Shading Language (GLSL) that can optimize the performance of your game and simplify your workflow. Specifically, Layout qualifiers make your code more deterministic and increase performance by reducing your work. With so many recent updates and improvements to Android Wear, it's high time to share an updated overview of the platform. 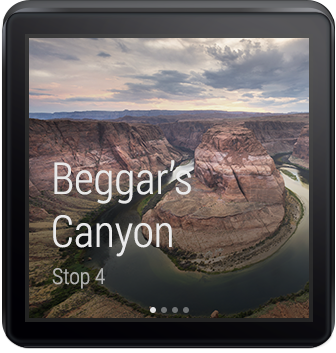 We're certainly not done—there's a lot more to come—but this is the picture today as you start or continue developing your groundbreaking Android Wear user experiences. 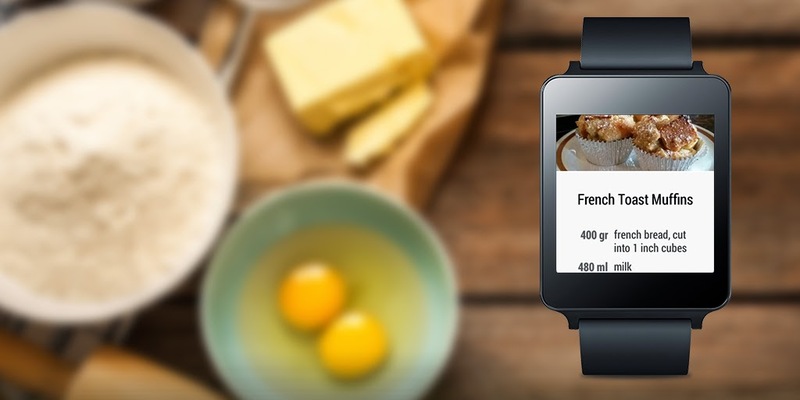 The Android Wear platform emphasizes depth and flexibility. Built on Android, it allows developers to use familiar APIs to create useful, performant, and imaginative apps that run directly on the watch. In the spirit of Android, you have the freedom to make substantial changes to the user experience, including the creation of custom watch faces. 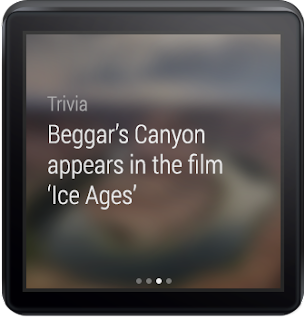 There are three main categories of experiences you can build: apps, custom watch faces, and notifications. 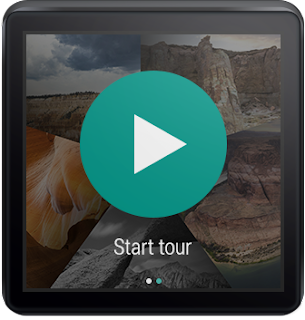 The ability to create custom watch faces gives you direct access to the most prominent UI element on a user's most personal device. The API is simple enough to build watch faces quickly and flexible enough to allow personalization. Again, given the depth and flexibility of the Android platform, you can create something for the user that's both beautiful and packed with unique features. The development journey starts with the simplicity of bringing your design to the wrist. 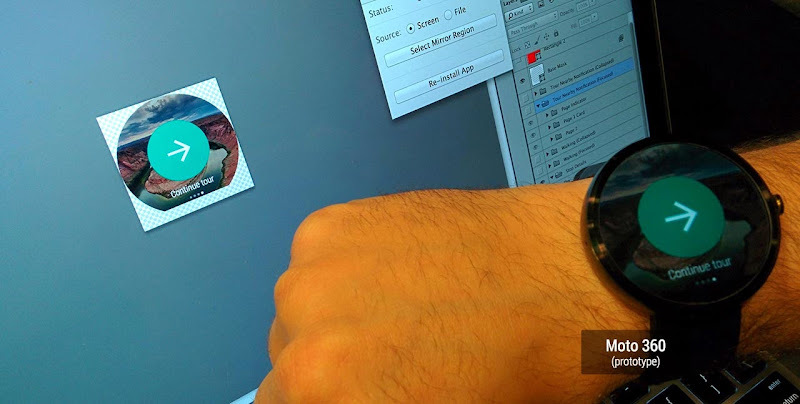 At the core of the watch face API is the onDraw method that allows you to draw whatever design you can think of to the canvas at a high enough frame rate to deliver fluid animation. This will come through at full fidelity while the watch is in interactive mode. 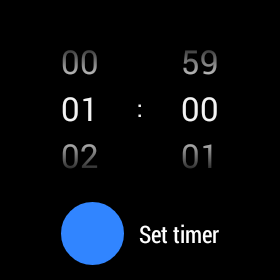 At other times, when the watch is in ambient mode, you're able to draw a more discreet version of the watch face. Additional preferences can be set to arrange the system UI elements appropriately for your design. Once those basics are covered, the limits are your imagination! You can go further with additions like the moon phase, current weather, or fitness stats. Watchmakers call these items "complications" -- but with Android they're hardly complicated. Once you have the data, just draw it on the canvas as you did the time. Of course, Android Wear Notifications are the easiest way to get started in the world of wearables. 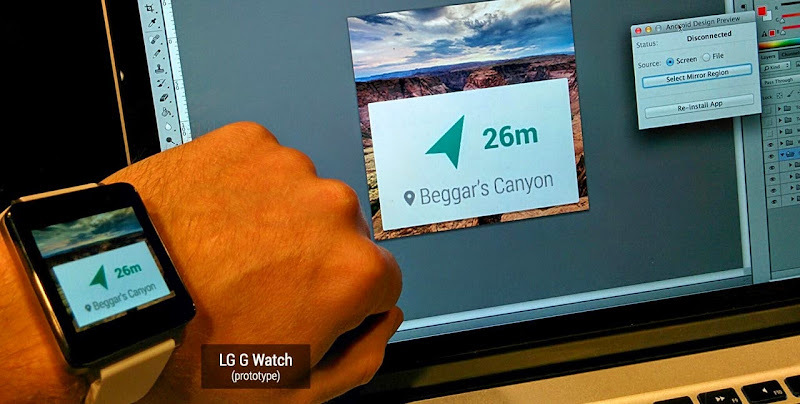 If you've got an Android app with notifications -- they already work on a Wear watch. 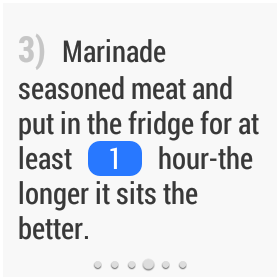 If you've already enhanced your notification with actions, this is even better and also automatically already works. You can take things further with Wear-specific functionality like Stacks, Pages, and Voice Replies that make your notifications richer experiences on the wrist. 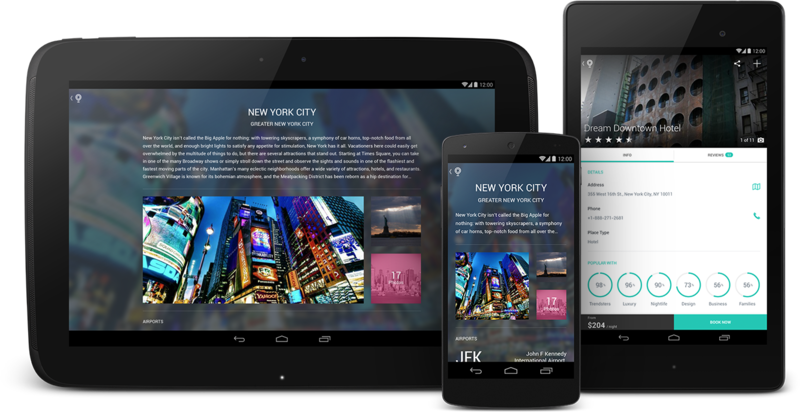 The user experiences you build for Wear get to take advantage of the power and flexibility of the Android platform. 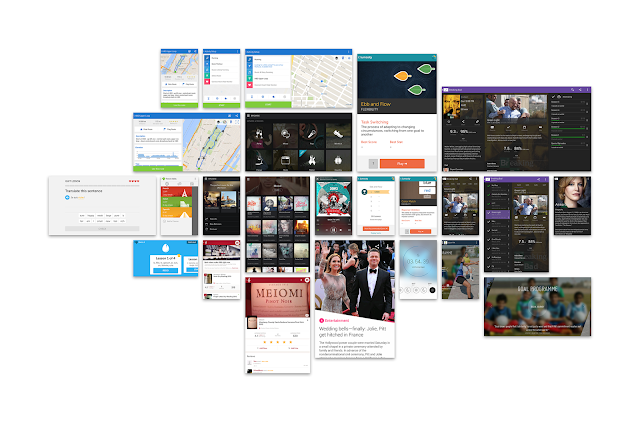 It's easy to get started and possible to create truly groundbreaking UI for your users. Together, we can create an ecosystem of user experiences as diverse as the watches they run on and the people who wear them. Check out the developer videos and documentation for more, and share your thoughts on the Android Wear Developers community. 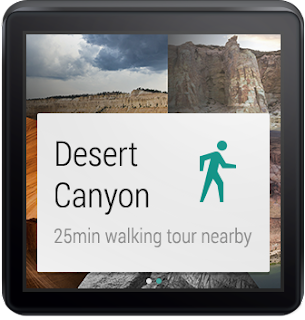 We can’t wait to see the innovative user experiences you will build on Android Wear. 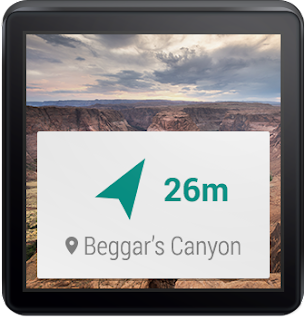 With the latest release of Android Wear, wearables with built-in GPS like the Sony Smartwatch 3 can now give you a GPS location update directly from the wearable, without a paired phone nearby. 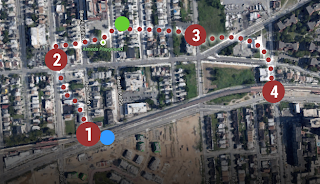 You can now build an app like MyTracks that lets a user track their run even when they leave their phone at home. 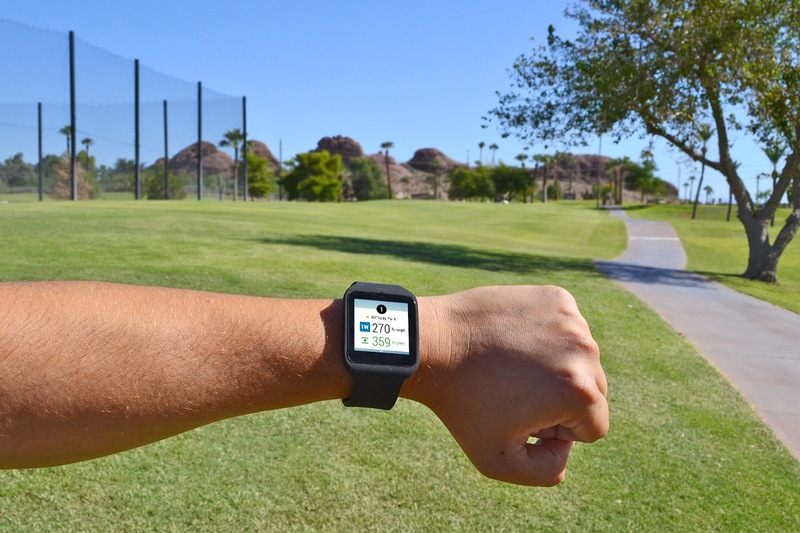 For wearable devices that do not have built-in GPS, a software solution has always existed in Google Play Services that automatically uses the GPS from your connected phone. The Golfshot wearable app uses built-in GPS to calculate your distance to the next hole, even when you don’t have your phone with you. 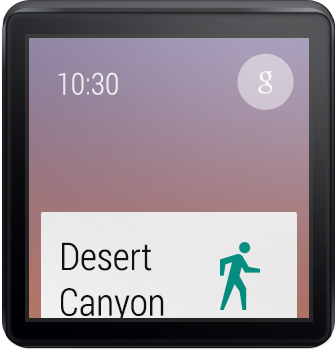 Implementing GPS location updates for Android Wear is simple. 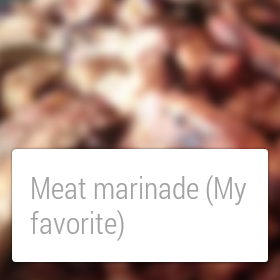 On the wearable, use the FusedLocationProviderApi from Google Play services to request location updates. This is the same API that has been available on mobile, so you can easily reuse your existing code and samples. FusedLocationProviderApi automatically makes the most power-efficient decision about where to get location updates. If the phone is connected to the wearable, it uses the GPS on the phone and sends the updates to the wearable. If the phone is not connected to the wearable and the wearable has a built-in GPS, then it uses the wearable’s GPS. One case you’ll need to handle is if the phone is not connected to the wearable and the wearable does not have built-in GPS. You will need to detect this and provide a graceful recovery mechanism, such as a message telling the user to bring their phone with them. However, for the most part, deciding which GPS to use, and sending the position from the phone to the wearable, is handled automatically. You do not need to deal with the low-level implementation details yourself. When writing an app that runs on the wearable, you will eventually want to synchronize the data it collects with the paired phone. When the wearable is being taken out for a run, especially with the built-in GPS, there may not be a phone present. So you will want to store your location data using the Data Layer API, and when the phone reconnects with the wearable later, the data will be automatically synchronized. 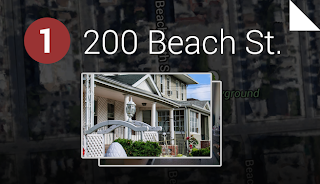 For more details about how to use the location API, check out the extensive documentation and sample here. Also, as a heads up, starting on November 3 with the public release of Android 5.0, you will be able to submit your apps for clearer designation as Android Wear apps on Google Play. If your apps follow the criteria in the Wear App Quality checklist and are accepted as Wear apps on Play, it will be easier for Android Wear users to discover your apps. Stay tuned for more information about how to submit your apps for Android Wear review through the Google Play Developer Console. Game developers, we've just released FlatBuffers, a C++ serialization library that allows you to read data without unpacking or allocating additional memory, as an open source project. FlatBuffers stores serialized data in buffers in a cross-platform way, supporting format evolution that is fully forwards and backwards compatible through a schema. These buffers can be stored in files or sent across the network as-is, and accessed in-place without parsing overhead. The FlatBuffers schema compiler and runtime is written in platform independent C++ with no library dependencies outside the STL, which makes it possible to use on any platform that has a C++ compiler. We have provided methods to build the FlatBuffers library, example applications, and unit tests for Android, Linux, OSX and Windows. The schema compiler can generate code to read and write FlatBuffers binary files for C++ and Java. It can additionally parse JSON-formatted data into type-safe binaries. Game developers can use this library to store game data with less overhead than alternative solutions (e.g. Protocol Buffers or JSON). We’re excited about the possibilities, and want to hear from you about how we can make this even better! Download the latest release from the FlatBuffers page in GitHub and join our discussion list! Fun Propulsion Labs is a team within Google that's dedicated to advancing gaming on Android and other platforms.